At Karsten, our philosophy on supporting the community is the same as working on a project: it’s our job. As a company, and as individual team members, we put a strong focus on enriching the lives of those in need. Whether we’re cooking for veterans or building a house for a family, we take pride in actively engaging with the community. When Hurricane Rita tore through Texas in 2005, it caught Port Arthur’s Sabine Pass Firehouse in its path. The storm wrought devastating damage and left the building in need of repair. Shortly after, Extreme Makeover: Home Edition — and a group of concerned community members — came together to restore the structure in to the strong, dependable building emergency personnel required to do their jobs. Karsten was glad to show our support and make a difference to a community that had undergone so much. Rebuilding Together Houston was created in 1982 by a dynamic group corporate leaders who were concerned about the plight of Houston’s low-income elderly homeowners. They brought together their employees as volunteers and, importantly, their financial resources to support the new agency’s mission of delivering help and hope. Karsten Interior Services has taken on numerous Rebuilding Together Houston projects through the years. 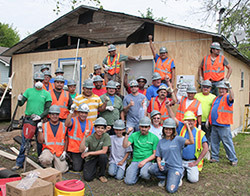 Most recently, in early 2016, the company joined forces with Houston Christian High School to make repairs on five elderly residents’ homes. The endeavor, part of a community service project launched by the high school’s junior class, brought the teams together to perform light carpentry work such as siding replacement, screen door installation, window trim replacement and other similar tasks. The mission of Faith in Practice is to improve the physical, spiritual and economic conditions of the poor in Guatemala through short-term medical and dental mission trips and related educational programs. The organization’s mission is based on an ecumenical understanding that, as people of God, we are called to demonstrate love and compassion as an outward sign of God’s presence among us. Faith in Practice’s life-changing medical mission is to minister to the poor while providing a spiritual experience for volunteers. Since its first hospital opened in 1907, Memorial Hermann has been changing the face of healthcare across Greater Houston through a focus on quality, continuous innovation and patient-centered care. As a not-for-profit provider, Memorial Hermann is a vital resource and safety net for more than five million people living throughout Greater Houston and surrounding communities. It provides world-class care close to home, offering access to a continuum of comprehensive care and crucial specialty services throughout the broad geographic area the system serves. MD Anderson Cancer Center’s Children’s Art Project allows children in the center’s care the opportunity to embrace their artistic talents and lend their designs to greeting cards, clothing, jewelry and home décor. Completed items become available for purchase both online and in physical retail shops, and proceeds benefit various patient programs. Karsten is proud to give back to an organization that makes a meaningful difference to some of our community’s youngest and most fragile residents. Building New Foundations is on a mission to positively impact disadvantaged youth throughout the Greater Houston area. The organization got its initial start in 2009, with construction industry personnel who chose to donate their services to The Good Shepherd, a nonprofit group that aids boys ages 7-17 who have experienced abuse or neglect. Through motivational speaking events, hands-on construction projects and similar events, the group encourages personal growth for the organization’s boys, while also improving their surroundings. Karsten is glad to lend our support to an organization taking measures to bring positive change to the city we call home.